AARON TIPPIN: Tippin has crusaded for the working man and woman since he ripped country music wide open with his uncompromising single "You’ve Got To Stand For Something." His voice continued to ring loud and clear with such hits as "I Wouldn’t Have It Any Other Way", "There Ain’t Nothin’ Wrong With The Radio", That’s As Close As I’ll Get To Loving You," "My Blue Angel" and "Kiss This". Five of his albums are certified "Gold" and a sixth CD—Read Between The Lines—stands at the "Platinum" level. Tippin’s honest lyrics and direct, impassioned vocals have built a large and devoted audience. 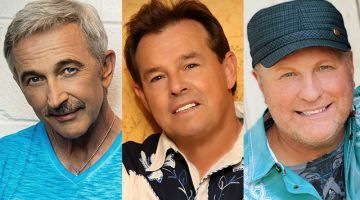 SAMMY KERSHAW: In the course of breaking into the ranks of stardom in country music, Sammy Kershaw has made contributions to more than just the charts. His platinum albums were propelled into the records books by hits such as "She Don’t Know She’s Beautiful," "I Can’t Reach Her Anymore," "National Working Woman’s Holiday," "Love Of My Life," "Cadillac Style," "Don’t Go Near The Water," "Haunted Heart,"…and many other milestones. COLLIN RAYE: Collin Raye is nothing if not passionate. His soulful delivery has set country standards in such searing ballads as "Love, Me," "In This Life," "Not That Different" and "If I Were You". Always an energizing showman, he has also blazed through such vivid rockers as "My Kind of Girl," "That’s My Story," "I Can Still Feel You" and "I Want You Bad." With 24 top ten records, 16 #1 hits, and having been a 10 time male vocalist of the year nominee (5 CMA and 5 ACM), this truly electrifying performer of his era remains one of the great voices of our time. Guests under 21 years of age must be accompanied by a legally responsible adult 30 years of age or older. All comp tickets not picked up will be released for sale. Prices plus tax, service and convenience fees.